Leftover cake mix can be used in this manner. In a microwavable or paper bowl, put about 1/2 cup of cake mix, add just enough water to moisten mix, then microwave. Time is just seconds. Keep close eye on it. Basically when MOST of the top has lost its shine. You can add a little frosting to the top, and wala, instant hot cake. No need for eggs, etc. You’ll be surprised its good. You can also add a little ice cream topping in the middle before you microwave and you’ll get kind of a “lava” cake thing going.. Yummy! Try it. made these last night… AAAAAMAZING! I just made these and I might eat them all. Thank goodness the kids won’t let me do that! Thanks for the idea. Made the cake cookies too and they are great. what does 6 oz of cake mix equal in cup measurements? 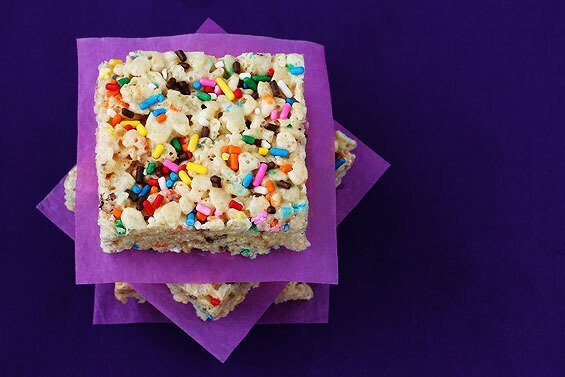 Just made these cake batter rice krispie treats! Love. Thanks for sharing!!! Do you need to spray the pan? 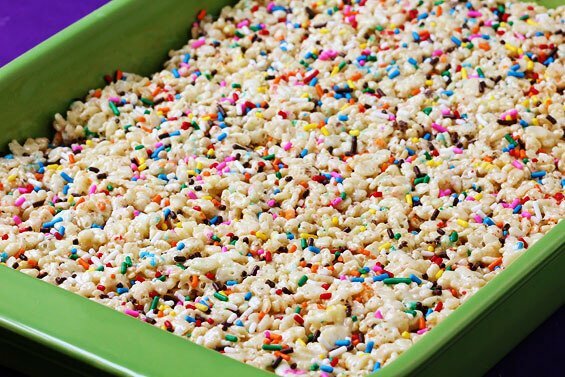 you could do this with cocoa crispies, chocolate cake mix and either the chocolate sprinkles or the non-peril(sp?) sprinkles. I just used the Funfetti cake mix for mine! It tastes great and already has the sprinkles in it! I just made these! I have to admit that I don’t taste much difference. I guess I need to add more cake mix…? I LOVE the cookies I made with the left over mix. Now I’m off to try the micro-cake. Yum! I just wanted to thank you for the recipe and how to use the additional cake mix. I don’t like to waste so it was really helpful that you put what to do with the remaining mix at the end of the recipe. Thank you so much!!! I cannot wait to try these! Just found this on pinterest..I have cake mix left over from making funfetti dip. This will be perfect!! I made these last night and they were delicious right after they were made. But today they were super hard :( Any ideas as to why they turned to cement over night? These were fine, didn’t seem much different from regular Crispy Treats, however, the cake mix cookies were VERY addicting! These treats were delicious! However, the cookies didn’t turn out when I made them as it said. Any thoughts as to why? Made these this afternoon, and added a whole cup (yes, 1 cup!) of funfetti cake mix. They’re so delicious. i also made a coffee mug of cake (combined the mix with just enough water to make it damp) and microwaved it for about 45 seconds.. yummy quick snack with the leftover cake mix! For the”cake mix” do I just add all of the dry ingredients as if I’m making a cake like the box says, or is it just solely the cake mix that comes in the box? Julia–just the cake mix as it comes out of the box–do not add anything to it. Remaining cake mix can also be mixed with an egg and a little cool whip (enough to be a stiff batter) and then drop one spoon at a time into powdered sugar then bake at 35o for 10-12 mins. 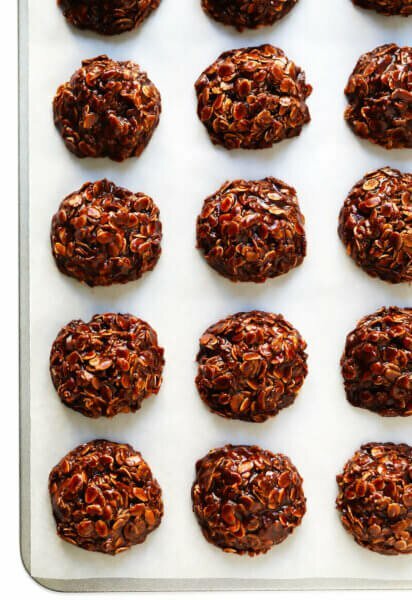 They’re even lighter than using the oil and they’re so yummy! Thanks for this recipie! I just made this and wanted to share my tips! Anytime I make Rice Krispies I use about 1T. more butter than it calls for and I use between 1/2-1cup LESS cereal. I don ‘t like my rice krispies getting hard! Oh and I used 1/2 cup of the cake mix! Is it safe to consume raw cake batter without baking? I thought it needed to reach high temperatures to be safely eaten? You are not putting egg in the batter so eating just plan batter you will be ok..your not suppose to consume raw cookie dough or anything with raw egg..but i have been eating cookie dough and cake batter my whole life and i am just fine! Wow therer are some talented people here! Got to try them all!!!! this was next on my list for my cake batter adventures! yay! your pics are GORGEOUS! 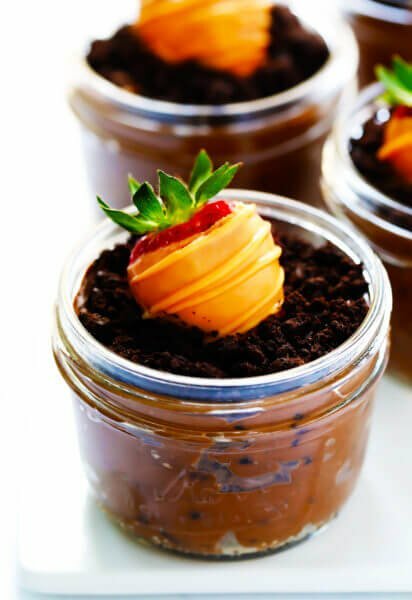 I use leftover cake mix from things like this to make a small dump cake with canned peaches in pear juice. I just pour 2 cans of peaches, juice and all, into a small-ish buttered baking dish (slice if they aren’t already), sprinkle them lightly with cinnamon and nutmeg, distribute the cake mix over them evenly, cover that with little thin slices of cold butter, then bake at 350F until it’s bubbly and the top is caramelized, about 45 minutes. You just have to make sure the cake mix is well covered with the butter. It’s not that you need a lot, it’s that any cake mix left untouched by butter won’t necessarily caramelize. The edges will bubble up, but you need good butter coverage everywhere else. So, lots of very thin slices. Otherwise, it’s very easy to make and good on a cold night. We usually just pour a bit of cold heavy cream over it, but it’s good with ice cream or whipped cream too. CATUION ! The Food Safety News has found that dry flour ( as in dry cake mix ) can contain E coli. I actually did 3/4 c cake mix, but everyone loved it! I made some today w/ Duncan Hines Strawberry Supreme cake mix and it was pretty amazing. For the chocolate lovers… I used Cocoa Krispies w/ chocolate cake mix. Lotsa chocolate but pretty yummy. Hi Gina…favorite sweet is rice kris pie treat…always happy to find a new recipe. I just joined and you’re the first person to pop up. Thanks for the recipe. Made these and they were WONDERFUL!!! I used an 12×18 jelly roll pan lined with “no-stick” aluminum foil to press the mixture in to cool. A piece of the “no-stick” foil is also great to press the mixture into the pan as well. I used vanilla Carmel marshmallows in them! Almost taste like coffee. Really good! The cookies did not turn out for me, but the treats were wonderful! Oh so very yummy! Thanks for sharing!! Not too bad. A new twist on a favorite treat. So when i made the cookie mix for the left over batter it turned out really runny and i couldnt form it into balls.. any suggestions? Thank you!! Spied this on Pinterest – taking all of my self control to not drive to store and buy these ingredients! great pictures too! I made these and they wound up rock hard as well!! Any solutions to make them soften up? 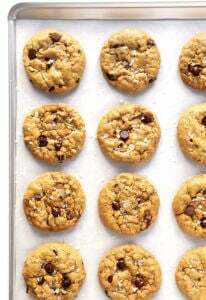 For all of those having problems with the cookies, you need way more than 6oz of dry cake mix with 1/4 cup of oil! I used around 14oz and the cookies came out perfect still used the 1 egg as well. 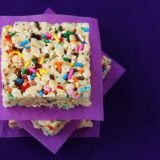 Rice crispy treaties were also perfect did use slightly less cereal though. Yay! I’m making these right this second. Thanks for such a fun recipe!!!! These sound great! I have marshmallow fluff/creme, but no marshmallows. Do you know how I could use the fluff instead? Thanks!